Harrogate-based Slingsby Gin has announced the launch of its brand new gooseberry flavoured Gin available to purchase online and in the Slingsby store in Harrogate. Co-founders Marcus Black and Mike Carthy travelled to New Zealand in 2017 as part of the brands sponsorship of the Lions Rugby tour, and whilst over there were inspired by the fruity tones of a crisp New Zealand sauvignon blanc and wanted to develop a new flavour for the Gin market in the UK that captured the unique finish on the palate. The award winning Slingsby Gin team have since develop a gin that encapsulated the tangy sharpness of the gooseberry and while the new addition to the brand started out as an experiment available only for customers to sample at their Harrogate store, the positive feedback meant that the Gooseberry Gin went into production! Following the success of the multi award-winning Slingsby Rhubarb Gin which launched in the same way in 2016, the gooseberry variant uses the same botanical mix and classic citrus base but this time with the addition of fresh locally sourced Yorkshire gooseberries that deliver an unmissable tangy sharpness tempered with a sweet and fruity finish. The final product is clean, refreshing and tangy, and is sure to turn wine drinkers green with envy. 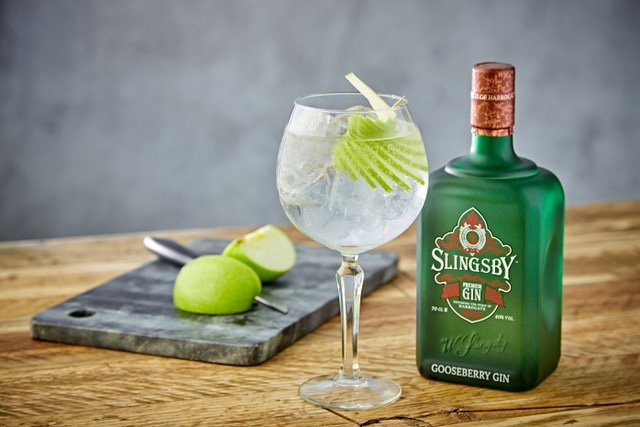 Slingsby recommend serving with a Mediterranean tonic, and a sliced apple fan to create the most delicious GG&T. Slingsby Gooseberry Gin is available to buy online at www.spiritofharrogate.co.uk/shop and in the Harrogate store as well as in selected World Duty Free shops.